How many Units (250 gram)? Wheatgrass is arguably the nutritional king of green foods. Recently, there has been an explosion of renewed interest in green products. These whole foods provide a tremendous amount of nutrition in a very small package. Of course, all plants are not created equal, and wheatgrass is arguably the nutritional king of green foods. As is the case with many grasses, wheatgrass must be juiced before the human body can utilize the astounding number of nutrients that are present in the plant. The strong cellulose in the plant makes it too woody and fibrous for the long and complex intestines in humans. However, once juiced, all of those nutrients are immediately available to the body. Wheatgrass juice has a long list of uses-both internal and external. The late Dr. Ann Wigmore, N.D., D.D., founder of the Hippocrates Health Institute, used the juice of young wheatgrass orally as well as in colonics to help with different ailments. She also used the juice for detoxification and rejuvenation processes. She experimented with many different types of grasses-barley, alfalfa, wheatgrass-but she found wheatgrass juice to be the most effective juice of all the grasses. Wheatgrass juice has lutein, found in green leaves, egg yolks and certain hormones, which is great for eyesight. It also contains folic acid and iron, essential to pregnant women and important to the health of the rest of us, as well. Wheatgrass juice provides a far greater amount of essential amino acids than other plant source. These are just a few of the many nutrients that are found in this remarkable plant and its juice. Of course, any plant is only as high in nutrients as the soil it is grown in. There are many commercial producers of grass juices. It benefits the consumer to get a little information before choosing a green product. All wheatgrass is not the same, and neither are the farms that grow it. If you are looking for life-force energy and live enzyme activity, then look for producers that grow and harvest continually, not just once a year. Look for producers that use processing methods that preserve live enzymes and sensitive nutrients, like low temperature radiant zone drying. Heat induction methods that process these foods in a matter of minutes instead of hours may be good for the bottom line of the company, but they are not good for the bottom line of the consumer's health. Many people think that more ingredients on the label are better when it comes to nutritional supplements, but this is not necessarily true. What if some of those ingredients are virtually nothing more than filler and are adding little to no nutritional value? In that case, you are taking large servings or multiple servings per day to get the same nutritional value as a product that has only one or two premium ingredients. What if the ingredients are processed with heat, losing the valuable live enzymes and heat sensitive vitamins? What if the ingredients are only processed once a year and are not fresh, having lost much of the nutritional value they once had? Suddenly that long list of ingredients isn't so appealing. A lot of us are used to looking for high vitamin and mineral percentages on a bottle. This comes from purchasing supplements that are not classed as food. The foods we eat, even well grown organic vegetables, do not have high RDA values. Green foods, such as radiant zone dried certified organic wheatgrass juice, are exactly that-foods. The body knows how to utilize the nutrients that are in those foods naturally, so the percentage of daily value per serving of these green foods is not going to be nearly so high as, for instance, synthetic isolated supplements. So now imagine: the soil is properly nourished with minerals, then add sunlight and pure water. In this equation you've got a plant that is properly nourished. This then provides your body with the nutrients it really needs. Healthy soil, the energy of the sun and clean water produce a synergy that cannot be duplicated in a laboratory. No artificial, isolated substances, recombined to make some kind of "superfood" can have the same nourishing effect. Our bodies know the difference. Radiant Zone DryingT was issued patent number 6,539,645 in 2003. The drying technology was created by engineers at Columbia PhytoTechnology LLC of Pullman, Washington, with the objective of processing difficult to dry and sensitive products. Wet products are applied to an optically transparent belt. The transparency allows radiant heat from dry radiant heaters to pass through the belt directly into the wet product. The amount of heat transferred to the product is controlled by infrared sensors that read the product temperature and moisture content. The radiant heaters and sensors are arranged in successive zones. The zones allow the dryer to compensate for the decrease in evaporative cooling during drying. In the first few zones the moisture content is relatively high. Therefore, more heat can be applied while maintaining a low product temperature. This results in higher throughput than other belt drying methods. As the product dries, less heat is required to maintain the set product temperature, and the controllers modulate the heaters' output. This results in a gentle drying process that produces high quality products. Products high in sugars and carbohydrates can be dried without carriers. The sugars anneal into crystalline particles that are highly flowable at any specified particle size. Oils and resins can be plated at high percentages onto carriers to produce flowable powders. In fact, just about any slurry can be dried or plated. Taste, color and nutrient content of carrier free products are undiluted, providing more value. Also, consumers are seeking "low carb" products that do not contain maltodextrin. Carrier free products are less expensive to produce organically. Columbia PhytoTechnology LLC recently published an article to demonstrate the immune stimulation level of EchImmuneT, a polysacchride standardized extract. Also, the Electro-OxT tester measures antioxidant activity in the product during production. These bioactivity results provide proof of the quality of Radiant Zone DriedT products. Due to high process throughput, Radiant Zone DryingT bridges the gap between freeze dry quality and spray dry price. Wheat Grass, Barley Grass, Kamut Grass, Alphalpha, Spinach, Beets, Celery, Ginger, Innulin, Blueberry Powder, Apple Powder, Stevia Leaf Powder. "I used to have at least three cups of coffee just to get through the day. Now instead of an afternoon coffee break, I take a "Supergreens break" and have a glass of Bodyflex Supergreens mixed with some juice or water. This formula gives me sustainable energy throughout the day and I don't have that crash and burn feeling like I do with caffeine. I like how I feel taking the Supergreens so much that I don't drink coffee anymore and instead start my day with a Bodyflex Supergreens." "I have been taking different greens products for years and I am used to foul tasting greens products. 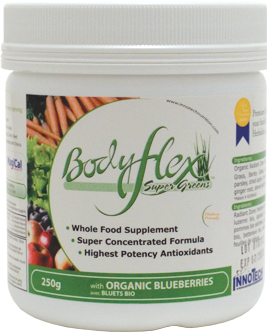 I have to tell you what a pleasant surprise it was to first taste Bodyflex Supergreens! It smelled natural and the way greens should smell-not synthetic and loaded with chemicals. You are actually able to taste the different fruits and vegetables in the product. I also liked that the product didn't have any herbal stimulants and that the list of ingredients wasn't a foot long." "I have never tried detoxing before, but my friends kept telling me how great they would feel after doing one. 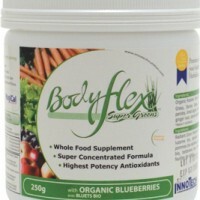 So, I visited my local health food store, and on the advice of one of the employees I bought the Bodyflex Supergreens. She said that since I have never detoxed before, this was a great product to start since it provides a gentle, daily detox. I haven't even finished my first jar and I feel like a completely different person-healty and full of energy!"